This is Zoya's Wicked collection- a gorgeous set of glittery, metallic shades to wear for the Fall. They come in shades of red, a purple and a green! 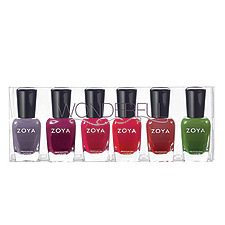 This is the Zoya Wonderful Collection. Though not glittery at all- this collection offers rich, creamy colors. My favorite is the Kelly shade- the gray shade that has hints of purple and blue undertones.